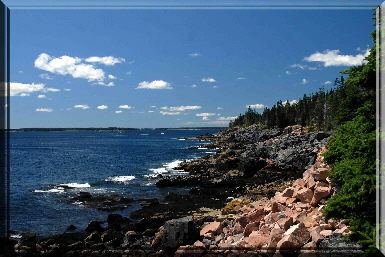 A beautiful blue sky day in Acadia National Park. This acreage was set aside for pure enjoyment of the out of doors in all seasons. This rugged coastline is pounded regularly by Winter and Summer storms alike. Tides vary greatly and leave their marks on the rocks by way of wear and tear as well as flotsam and jetsam.